Health Tropes Then and Now: Which Ones Do You Live By? It’s fun to watch old television commercials from the 1950s and 60s. For one thing, all the cars and fashions that were contemporary and hip during my childhood are now not only quaint, they are worth some bucks in the classic vintage market. Wish I could say the same for myself. We don’t know who coined this one, but it has its roots in Wales circa 1866, an era when science couldn’t yet prove how true this really is, as apples are full of anti-oxidants, flavonoids and fiber. 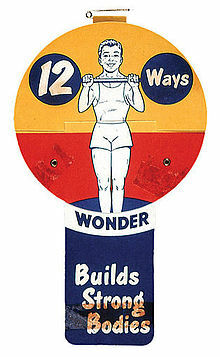 Wonder Bread builds strong bodies 12 ways. Wonder Bread is processed soft bread that first appeared in 1921, and whose nutrients initially were stripped away and preservatives added to prolong its shelf life. It was the first pre-sliced bread on the market, which led to some suspicion that it would dry out too quickly (it didn’t). During the 1940s, the government required that vitamins and minerals be added back into the bread for general public health. At the time, the population was threatened by diseases such as beriberi and pellagra, both caused by vitamin B deficiencies. The familiar slogan started out as building strong bodies 6 ways, but Uncle Sam doubled down on the Continental Baking Company to do better for the sake of consumers’ health. After the end of the postwar boom, we entered a prolonged health food phase that is still gaining momentum. Wonder Bread and all other bleached flour processed breads were made the pariahs of the food pyramid, while whole grains were touted as the healthier alternative. But even whole grains are getting a bad rap as we’ve now moved into a gluten-free craze. Bread is a short-chain carbohydrate that, according to nutrition authorities, is anathema to everyone, able-bodied and diseased alike. As you are well aware, there’s a big push to eliminate gluten and dairy even if you aren’t showing any signs of gluten intolerance (Celiac disease) or lactose intolerance. The mantra these days is veggies, fruits, gluten-free whole grains, nuts and lean meats. For patients who are moving farther away from pharmaceuticals and towards fresh whole foods to change the course of their MS through “clean eating,” what health tropes are out there now that market the latest claims, evidence-based or not? Humans are not built to ingest cow’s milk. It has sugars that can cause bloat, gas, diarrhea, indigestion. Everyone should eliminate dairy from their diets. Well, not so fast. Although there’s a theory that cow’s milk is responsible for most modern diseases of western civilization which epidemiologists have kicked around since the 19th century, one thing the Victorians did not have was modern technology and its influence on clinical testing. As you have undoubtedly noticed, the more studies conducted, the more diversity of opinion they generate. Milk that’s 2 percent fat or less is an excellent source of calcium, phosphorus, riboflavin, vitamin D, and vitamin B12, says registered dietician Susan Duncan, PhD. But Andy Bellatti, MS RD, claims that every nutrient in milk can be found in whole plant foods, and that we should get them from fibrous fruits and veggies for the amount of fiber that is lacking from our diets. The top two diets touted as beneficial to MS in particular are the Wahls’ and Swank diets. They are subjectively evidence-based, meaning the only studies conducted were done by the doctors who authored the diets, and without the use of control groups. Nevertheless, the authors are sincere in their insistence that their diets, which are both low in fat, can send your MS into remission and reverse disability. This doesn’t make them scam artists; the diets have their roots in numerous controlled cardiovascular studies that used large cohorts and showed repeatable, favorable results. The strain on the diet book doctors’ credibility lies mostly in their claims that diet can be directly connected to an MS patient’s remission. Since the overwhelming majority of multiple sclerosis cases are of the inflammatory, relapsing-remitting form, it is the nature of the disease to have periods of remission anyway. Still, many people with MS swear passionately that their adherence to an MS diet has cured them. When it comes to MS symptom remedies, it hardly matters whether we can give credit to a special regimen or the Fates. Whatever makes us feel better is what we’re going to do.